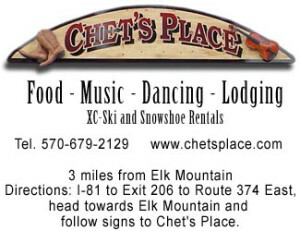 Chet’s Place – Choice of one, two and three bedroom suites. Dining, spirits and entertainment next door. Cross county ski and snow shoe rentals on site. 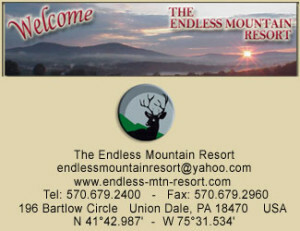 Just minutes and an easy drive to Elk Mountain Ski Resort. 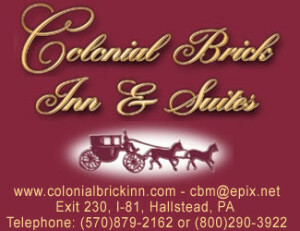 Colonial Brick Inn & Suites – 53 deluxe guest rooms and suites with free Internet located in a plaza with many restaurants and specialty shops. Easy on / Easy off 1-81 Exit 230. Call today to reserve your Golf or Ski package or reserve on line. 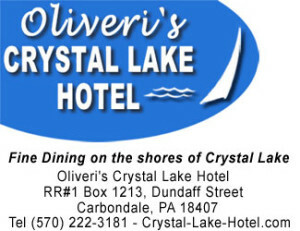 Oliveri’s Crystal Lake Hotel & Lodge – The Oliveri family welcomes guests to “The Hotel” on luminous Crystal Lake. Rates for the Standard Room, Luxury King, and Efficiency Studio include a generous continental breakfast buffet. Discounted lift ticket vouchers available. Fully equipped two room Suites are available to guests visiting for an extended time. American and Italian cuisine is served in a relaxed atmosphere of informal elegance. Endless Mountain Resort – Tastefully Appointed Two Bedroom Townhouses in a Relaxed Country Atmosphere. Time Shares and rentals available. Situated on over 58 secluded acres just two miles from Elk Mountain. On site Recreation Center with heated indoor pool, hot tub, and fitness room. 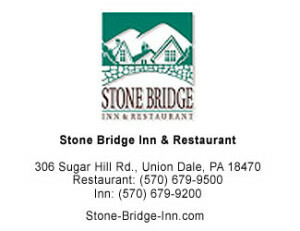 Stone Bridge Inn – Unique rooms with quaint European style, fireplaces and views of the surrounding countryside and Elk Mountain. Our cozy tavern, with its stone fireplace and moosehead, offers entertainment on weekends and a plentiful menu! Our restaurant features fine dining in a casual atmosphere with continental cuisine.